A scribe’s role is to assist physicians by accompanying them during the medical history-taking and exam, recording details of the history and exam into the medical record, and coordinating with departmental resources regarding tests, orders, radiology and results. The scribe tracks the results of orders for each patient, records results into the EMR, and notifies the physician of results as they arrive. DocAssist scribes experience firsthand the interaction between physicians and patients. They observe the entire process including history and physical, diagnostic interpretation, and disposition. DocAssist allows scribes to fully immerse themselves in the medical field unlike most other jobs. DocAssist is looking for candidates interested in working 2-3 shifts a week in a hospital/clinic setting. 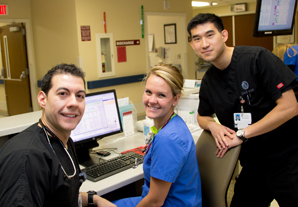 DocAssist Training Program provides extensive instruction and training to scribes before working with a physician.